The Skinny: Cool update of the classic wuxia formula that's entertaining and involving, though also a bit remote in tone. The modern dress and rural setting make for a decidely different swordplay experience. by Kozo: This arty flick takes place in bizarre world where everyone wears suits and long coats but no one has guns. Instead, they battle with swords like the wuxia of old. 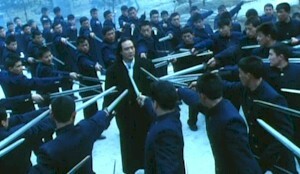 Daniel Lee directed this decidely offbeat take on the swordsman genre. His story concerns a young man (Wu Xing-Guo) who finds himself caught up in a twenty year-old grudge between his father (David Chiang) and his adopted stepfather (Norman Tsui), who took Wu from his family years ago. Making things worse is his best friend (Jack Gao), who's in love with his girl (Charlie Young), and tries to take her forcibly.